One of the strangest thing about the Goodies is its lack of repeats. For some reason the episodes never seem to get repeated – any one know why? Initially the episodes for the Goodies were co-written by all three Goodies (Tim, Graeme and Bill). 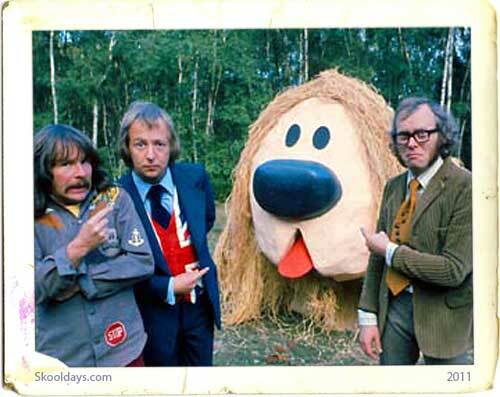 Later, the episodes were co-written by Graeme Garden and Bill Oddie. The music for the show was written by Bill Oddie, and The Goodies’ theme music was co-written by Bill Oddie and Michael Gibbs. The television series ran from November 1970 to February 1982 on BBC 2, with 70 episodes, mostly thirty minutes in length except for two forty-five minute Christmas specials (The Goodies and the Beanstalk and The Goodies Rule – O.K.?). Two episodes stand out for me. The Goodies and the Beanstalk and Kitten Kong. Both were outstanding in many ways and still are alluded to as amongst there best episodes. A popular European TV game show of the 60s and 70s. A trophy won by the 1969 Shrewsbury team can be seen during the episode. The Goodies have hit rock-bottom and are forced to sell Buttercup for a tin of baked beans. In an act of desperation, Graeme plants one of the beans and …. 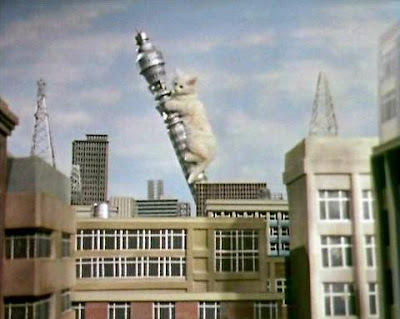 The Goodies in Kitten Kong was a perfect episode. It started off with them setting up an animal clinic and they then take in numerous kinds of animals with varying problems, including Twinkle the undersized kitten. When Graeme’s growth formula causes Twinkle to grow to an enormous size and wreak havoc on London, it is up to the Goodies to catch him. Superb in many ways is the havoc of a sweet kitten and the awful backdrop of cardboard London. This entry was posted in Pop Culture, PrimeTime and tagged 1970, 1980 by Skooldays. Bookmark the permalink.